So getting to 18 miles today was tough, to say the least. I got hit pretty bad with a cold this week, even missing a day of work, and wasn’t able to do any sort of midweek training. I was hopeful that getting the rest would make it so the cold didn’t progress. That seemed to have worked, but I still have had lingering symptoms, mainly sniffling and coughing that I imagine is going to persist for a bit longer. Nonetheless, in addition to just being antsy in general, I made myself get out for my long run. I tried to start out as optimistic as I could, given the circumstances. I thought about giving myself an “out” and cutting my run short, if needed. I actually felt alright this morning relative to the days prior. Since I knew I wasn’t going to be in top form I headed to the Minuteman Bike Path so I at least wouldn’t need to deal with hills in addition to the coughing and sniffling. – All the sniffling you thought was finally manageable will no longer be manageable because running will make your nose even more sniffly. – You will cough and wheeze while running and, as a result, everyone you approach from behind will turn to see who’s coming because you sound like the last thing you should be doing is running. – There is not enough water in the world to make you feel satisfied and hydrated. – Gu is even grosser than usual. I’ll spare you further explanation, use your imagination. – There’s seriously not enough water and you will contemplate eating the dirty snow (fortunately I talked myself out of that one). Anyways, being post stretch and shower I’m feeling a bit better. 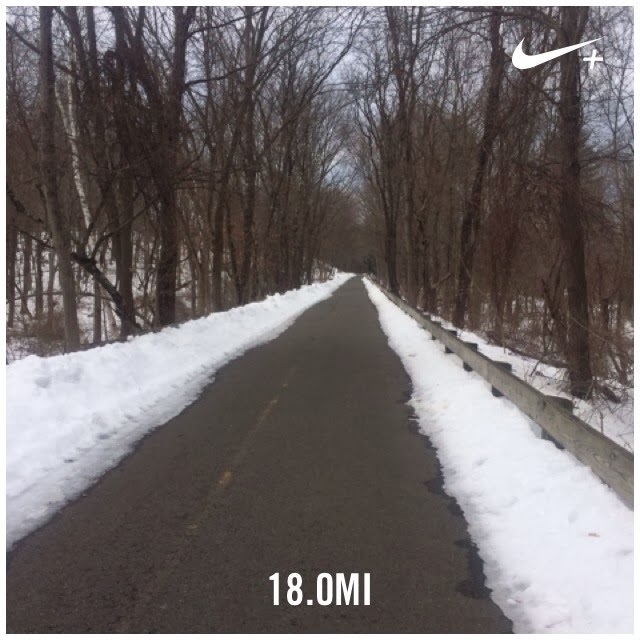 I’m thinking I might have made the poor decision to tackle the full 18 today, but it’s over and done and we’ll see what I’m feeling like tomorrow! 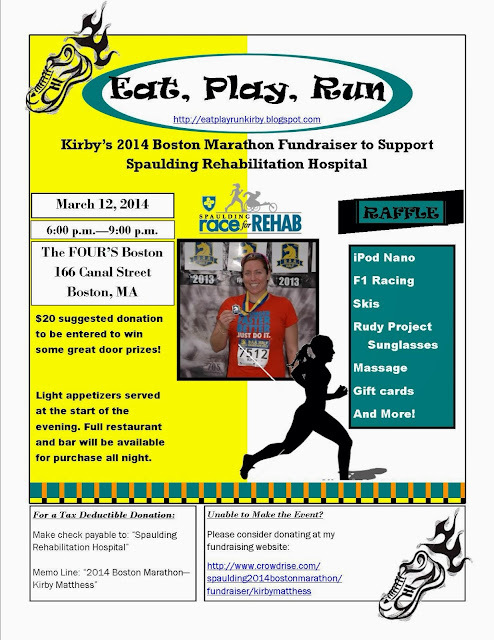 In other news, my fundraiser is next Wednesday, March 12th 6-9 pm at The Fours restaurant on Canal Street in Boston!! I’m getting wicked excited and there really are some great prizes. Hope you will be able to make it and feel free to bring friends!